Stand-up stapler features patented High Start power-assisted stapling technology so it is 70 percent easier to use than traditional staplers. 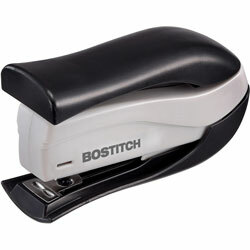 Easy squeeze stapling fastens up to 15 sheets of paper at a time. Small, ergonomic shape fits any hand. Drop-in loading with half-strip capacity works with standard staples. Capacity is 105 staples. Desktop stapler includes one rack of staples. Black Gray Manual Staplers from Accentra! 708 In Stock today.